Post-Punk Cinema Club: Why should I love: Naseeruddin Shah? Why should I love: Naseeruddin Shah? The second in our Why should I love? series. Naseeruddin Shah was actually the reason we started watching Hindi movies, as we enjoyed Monsoon Wedding so much that we immediately started asking every Desi friend of ours to recommend more Naseer. The most recommended movie? See #1. 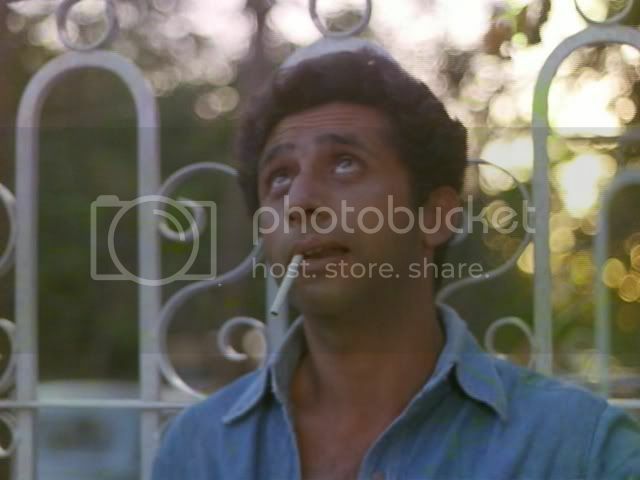 After nearly 100+ Hindi films, we still maintain that Naseer is India's best actor. Raj Kapoor was too variable. Shashi was reliably studly but also very predictable. If we continue with the Radiohead parallels, Naseer's like Kid A - the super-intelligent album that bucks all anticipation, refuses to conform, and refuses to play the popularity contest. Here's a Glastonbury performance of Idioteque from the Kid A album, and here's our favorite song from Masoom and one of our favorite Naseer scenes ever. Talking to the big guy upstairs in Bezubaan. 1. You should love Naseer because he may make mistakes sometimes, but, hey, we're all human. 2. You should love Naseer because he loves movies as much as the PPCC does! 4. You should love Naseer because he appreciates fine poetry. 5. You should love Naseer because he may be proud, but is not averse to learning and growing as a human being. 6. You should love Naseer because he's all about power to the people. 7. You should love Naseer because he sometimes is the people! 8. You should love Naseer because he can crack some really off-color jokes at the worst times. 9. You should love Naseer because he will fetch things for you and generally keep quiet, at least during the day. 10. You should love Naseer because he knows how to kick it, grumpy, paternal-style. I haven't seen much Naseer, so I'm commenting only to say that Monsoon Wedding is one of my favoritest movies ever. Have to admit that I have never been able to understand the appeal of Monsoon Wedding inspite of Naseer. But, he is a consistently good actor at everything he attempts. Inspite of being a troublemaker at the film Institute, Pune, (check out Shyam Benegal's interview at Star Talk for interesting facts about Naseer's early career) and having no chin he can play the romantic lead like no other! I was lucky enough to see him in a play at Bombay. He played Mahatma Gandhi in the play (Gandhi Viruddh Gandhi) and made a great Gandhi! I believe the play was later made into the movie Gandhi My Father! Just realised that the link for the chin reference is a TV show that is mostly in Hindi and Urdu, without subtitles. There is some English, ofcourse, but the reference to Naseer's chin (or lack thereof) is made by Raza Murad in Urdu. Apparently when Naseer first came to Bombay to become an actor, he stayed with Raza Murad's uncle. The uncle was astonished at Naseer's ambition and wondered aloud how he could become an actor as he had no chin! Thank you for such a lovely post! It was a sad day that Smita died, sicne post that, neither Om,Naseer nor Shabana have done much art-house stuff. My favorite firmly remains Mandi- amazing performances, a whos who of actors, and a v brilliant plot. Have you seen Dus Kahaniyaan? His story in that is sooooo touching! He kicks it with Shabana Azmi in that. He makes a few guest appearances in Stephen Alter's book on the making of Omkara, as well. Naseer is an interesting guy. 11) because his favorite actor is Shammi Kapoor and he isn't afraid to admit it! Even if I didn't love him before, his turn as Akbar in Today's Special and as Khalujaan in Ishqiya would have sold me, completely... Such a gift for stealing a scene! And he's bringing his theater company to Washington, DC in March...Hoorah!